Hello again and Happy Friday! I often find myself lusting over some random item, one that I don't really need and that I can definitely live without, yet lust I do. 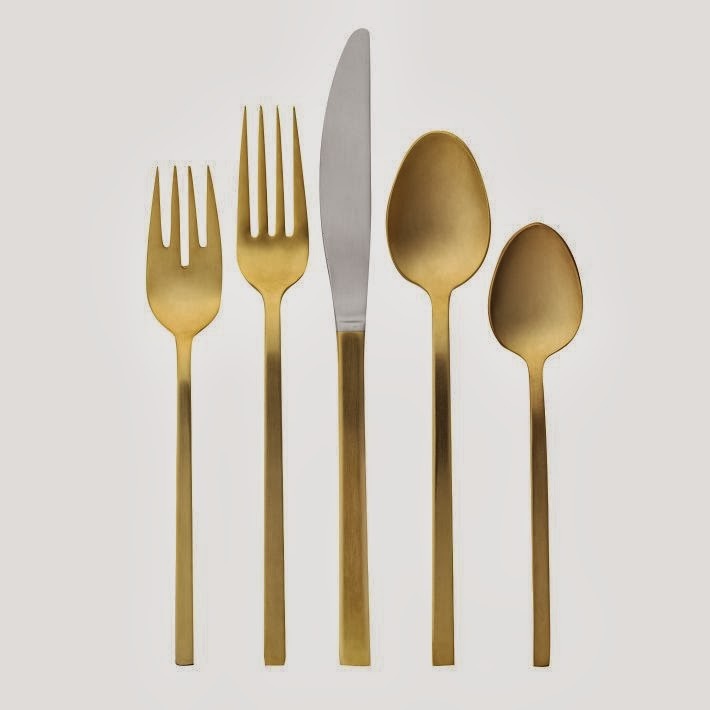 Case in point, a set of gold silverware from West Elm.......These to be exact. Yes, gold silverware. Anyone who knows me or who has been keeping up here knows that I'm all about gold, and the idea of having some soiree with gold utensils is a hell yea! must. If you're feeling sad for me, read on. As fate has it I was shopping one day at my local Home Goods (where there have been many Whitney spottings), and there they were. Gold silver ware! 3 sets of 4. It gets better, they were $49.99 each. I quickly realized that a) this was more than a 50% savings, and b) I did in fact have to have them and not only did I have to have them but I had to create an occasion to exhibit them in. 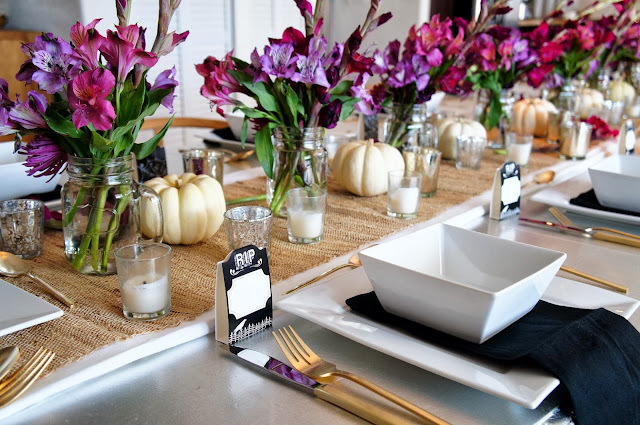 Fast forward to the makings of a "Chic Halloween Dinner Party". 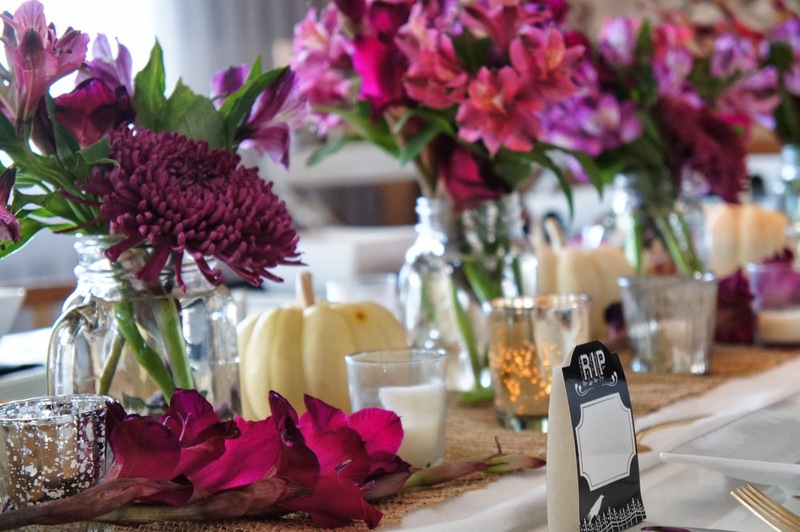 Though it's fun to decorate for Halloween, see my home and costume last year here Halloween Decor and here Day of the Dead Costume Reveal, it's also fun to create memories and moments with friends through entertaining for the holidays. You saw the gold silverware and its epic story above. I'm planning to make things especially fall and festive (even though I live in sunny Florida:-( ) by adding a burlap runner down my table similar to this table. I don't prefer anything else in that set up for my Chic Halloween Dinner Party. 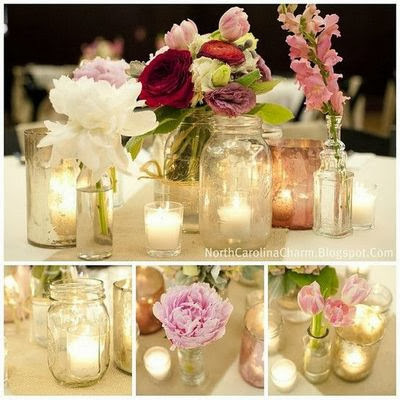 Instead I will add mason jars for my flower vases sprinkled down the table hopefully achieving something like these. What would a Halloween party be without some form of Halloween in the mix?! 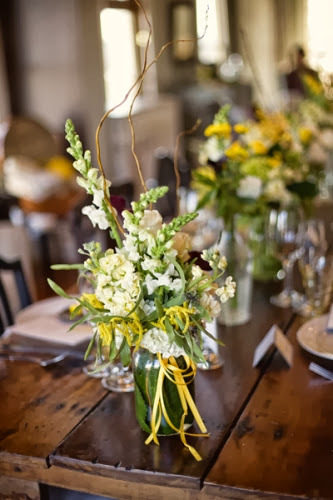 For my special theme I am going for something "pretty" by sprinkling the little white pumpkin gourds down my table along with my mason jars full of flowers, maybe something like these. 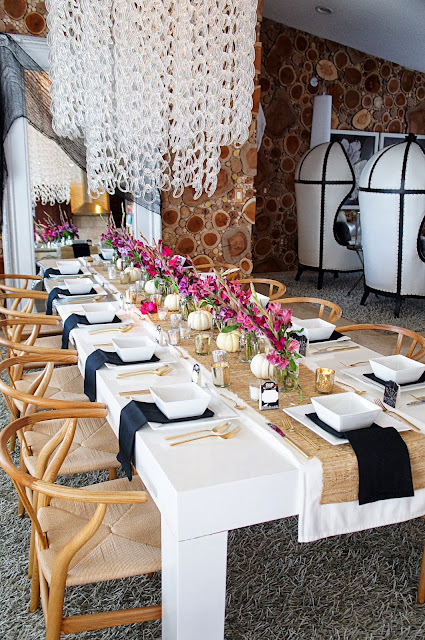 I love the table scape below! 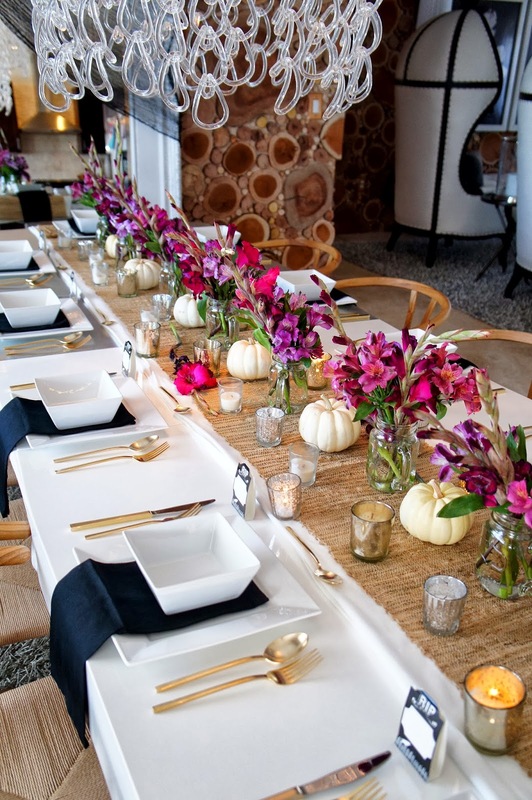 It embodies much of what I hoped to achieve in my own Chic Halloween Dinner Party table. Fall gets warmer as do the colors. 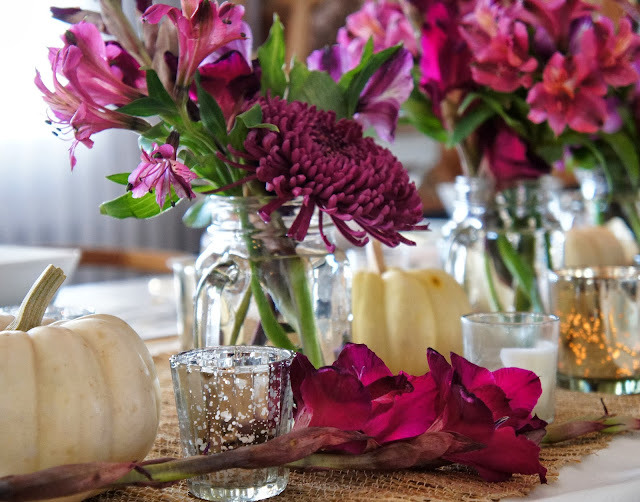 Burnt orange, cranberry and deep berry colors are perfect for flowers of any kind. Add some pumpkins and candles and really you can't go wrong. 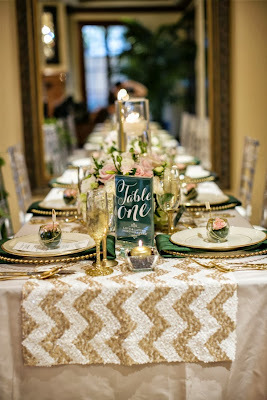 Want to see how my table turned out, and how I made it happen??? 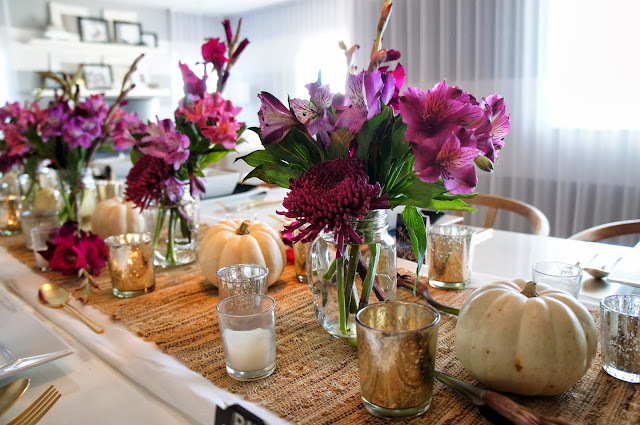 Take a look at my Chic Halloween Dinner Party decor. 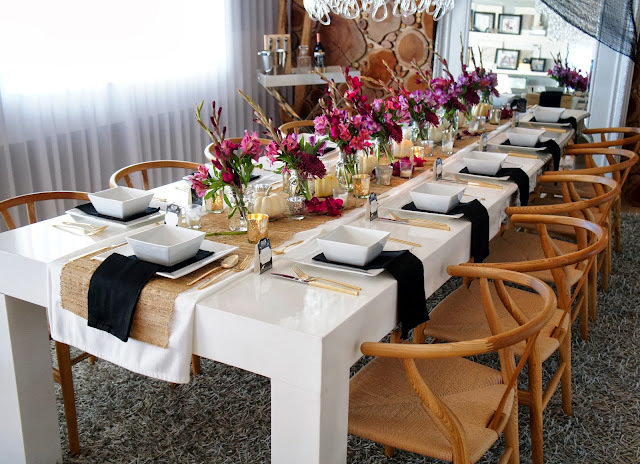 1) I started with a white table runner. I own it and use it as my base runner every time, and because it's white it is neutral and can be layered endlessly. 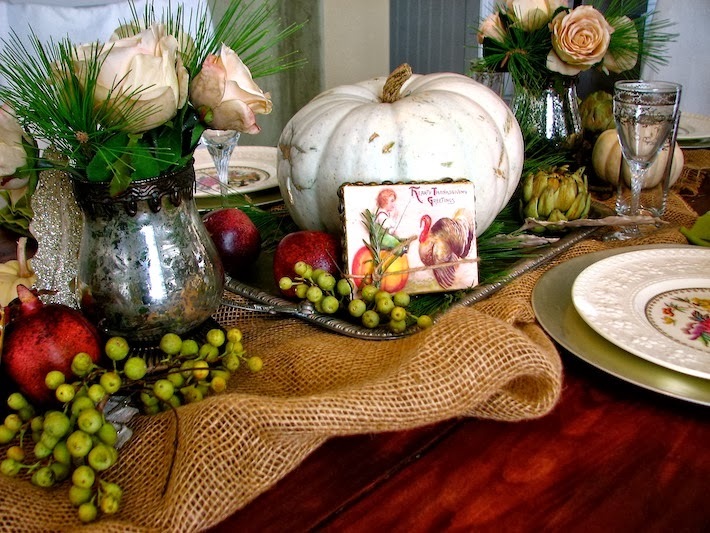 2) I added 2 burlap table runners that I found at Target for $15.00 each. Most people could use 1 but my table is over 120" long so I always need more. 3) I bought 2 boxes of mason jars from Ross which were 4 for $5.99. I then bought 6 misc bunches of berry colored flowers from my local grocery store that were 3 for $12.99. I separated the flowers by type, cut the stems and dispersed them throughout the mason jars. 4) I bought 8 white pumpkins from my local grocery store for $1.50 each and placed them in between the flowers. 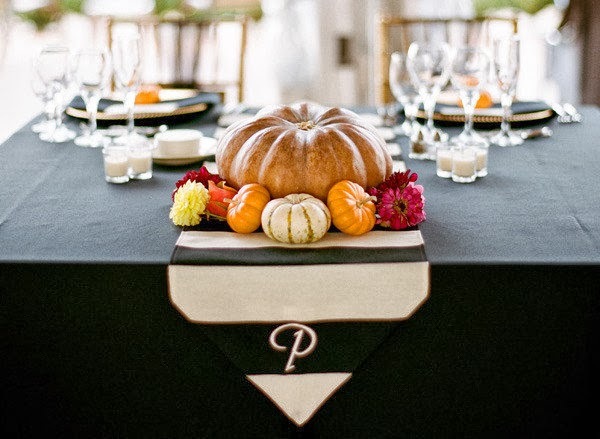 I chose white because I wanted the table to be "pretty" and "chic" and I find white pumpkins look better than orange, but this is purely my preference. I also added a few extra flower stems down the runner for an added layer. 5) I took out all of my various candle votives and added them all over the table. 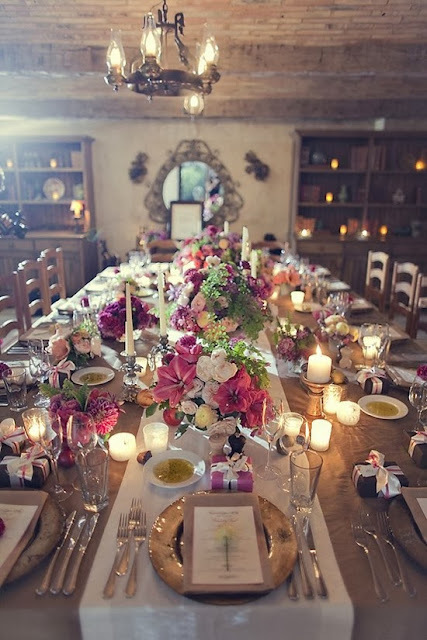 My biggest dinner party rule is that YOU CAN NEVER HAVE TOO MANY CANDLES, EVER! I have these on hand at all times, but you can score some from any craft store or local home store such as Target or Wal Mart for pretty good prices. You can buy candles and use these over and over. 6) I added my regular dishes which I have in all white because they are neutral and can be rotated to suit any occasion. I then separated them with a napkin draped between the two. I prefer cloth napkins for dinner parties and always have a variety in my home. I found that Target has a great selection and these black ones were 12 for $9.99. 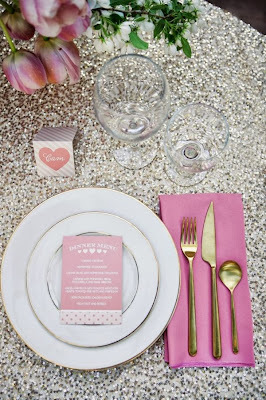 I then set each place with my new gold silver ware (secret high five to myself for this obsession score!). 7) I added a RIP name tag to each place setting for a lil something spooky. These are from Target, 4 for only $1.00!!! That's it my friends. 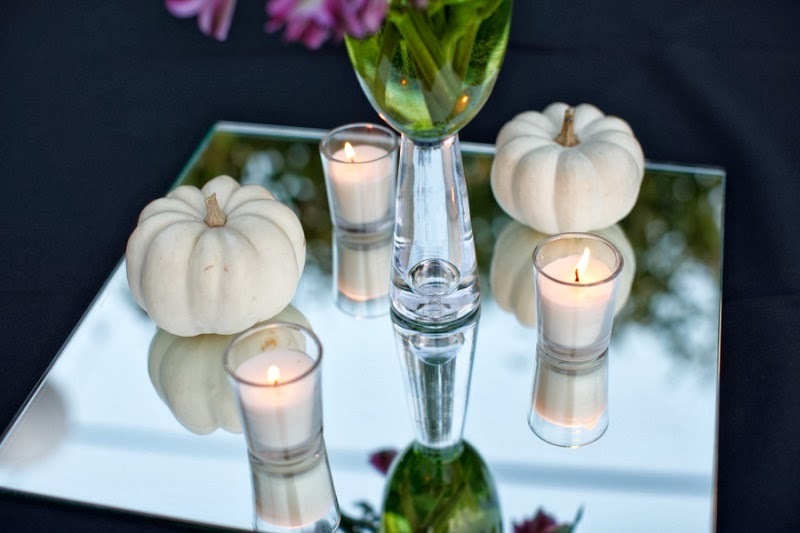 See how simple it can be with a little planning to dress up your table for a Chic Halloween Party? 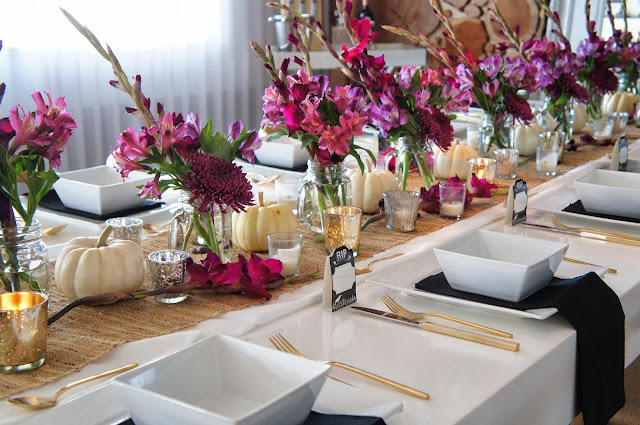 You will find that once you have the basics on hand, you can use them over and over and can easily change up the themes around your basic pieces for future parties. What are some of your ideas for decorating your parties? Do you like this "chic" version or do you prefer the traditional Halloween colors and style? One things that's for sure is that it's Friday, and I can't wait to break this table in! 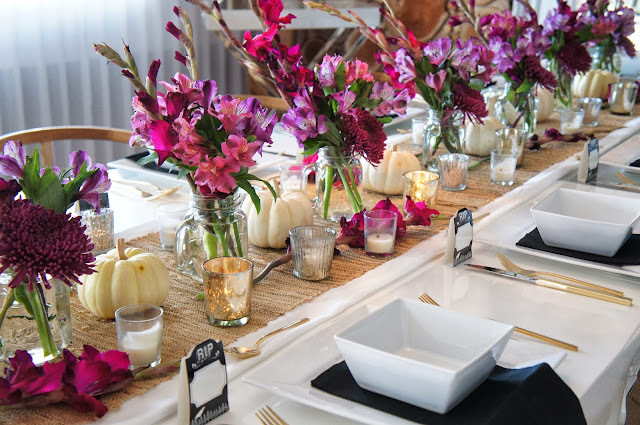 I really like how you used the mason jars along with the candles! That burlap runner LOVE! Thought about you and your love for gold at West Elm last week.. Went to purchase the metallic gold glassware sets but, they hadn't received shipment. Impatient me ordered online. Hi Minnimousemiami! It's been a while since I've heard from you;) Thanks for your sweet comments on the table decor. 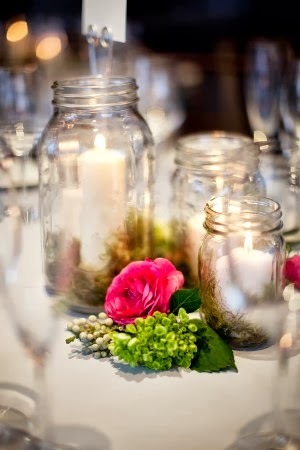 Yea, the mason jars are great and can later be used as drinking glasses for say a summer dinner party! Worth the investment. 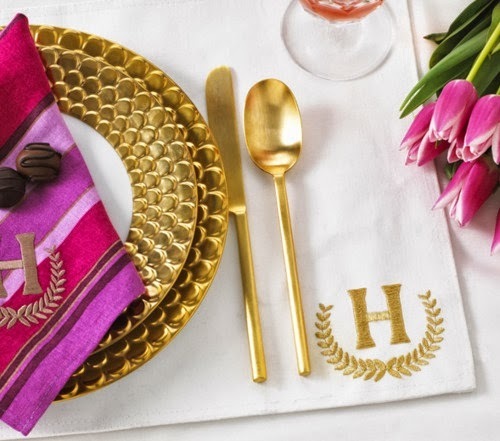 I'll have to go check out their new gold sets at West Elm, but you may also want to chack out Target because they are just now getting all their holiday in and you may find a good score there also.